Have I mentioned how much I hate Baroque art? When you see your second musuem of Baroque art housed in a former Habsburg palace, you understand the true function of art in the Baroque: wallpaper. "Pictures of Jesus" is Sarah's term for the endless galleries of competence on display, and while one Crucifixion may inspire wonder, ten Crucifixions inspire laughter, and a hundred inspire only a sense of vague esthetic numbness. After seeing four in a row, I swear to myself that if I see one more Judith with the head of Holofernes, I'm going to yuke. 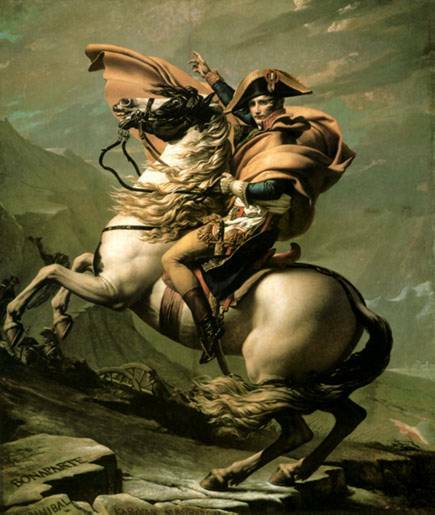 Apparently, some curator agrees with me, since they've hung Jacques-Louis David's portrait of Napoleon crossing the Alps in with the passions and the panoramas, and its ferocious tension slices through their gauzy excess like, well, Napoleon through Baroque Europe. In fact, Francis I, Habsburg emperor of Austria (although there known as Francis II, go figure) dissolved the Holy Roman Empire rather than see Napoleon crowned Emperor -- and I like to think of that moment, as much as any other, as the long-awaited and much-needed death-knell for the Baroque.